So far in 2018, we have nourished, supported and empowered 50% more low-income moms this year than last year, thanks to the generous support from so many of our private donors, as well as generous donations from the Ellis L. Phillips Foundation, Lululemon, and the Palo Alto Medical Foundation. We are deeply grateful for the opportunity to partner with such amazing foundations to promote maternal health and wellness for the benefit of children, families and communities! Our goal was to serve 90 low-incomes moms by December 2018. It is now September, and we have already met our goal. We have already served 128 low-income moms, and we still have the fall sessions to go! This fall, we expect to serve another 20 moms in our Zumba group in Half Moon Bay, 15 moms in our fall Nutrition group in Half Moon Bay and 10 moms in our Zumba class in East Palo Alto – for 45 low-income moms served. This would bring our total served in 2018 to 173. In the end, we will have supported 83 more moms with our 10-week wellness groups than we had planned, which means we not only met our goal, but we surpassed our goal by nearly 100%! 100% decreased the tendency to hit their children when misbehaving. 86% of our participants yell at their children less often. We are inspired by these results. We are currently putting plans in place to establish an Emerging Leaders Program. We have identified participants who engage fully in our programs. These Spanish-speaking, low-income mothers gasp the material, consistently apply the tools at home and demonstrate true leadership potential among their peers. Our first round of training is currently underway, and in 2019, we plan to hire, train and mentor Emerging Leaders to facilitate our Spanish-Speaking Groups. These former participants will serve as leaders as they empower parents in their communities with Positive Discipline tools. We are looking forward to continuing to expand our reach and further our mission in 2019. We are hoping to initiate groups in San Francisco, Santa Cruz and San Jose. We are currently seeking funding so we can establish these groups and support more moms – and by extension – their children and families. We are also taking steps to become an independent non-profit organization in 2019! We feel deeply blessed to be doing such meaningful and impactful work. Thank you for taking the time to read our update. We appreciate your interest and support! Our spring Wellness Groups for Low-Income Spanish-Speaking Moms were rich and rewarding. We nourished, supported and empowered several families, thanks to the support we have received from all of our donors. We are so grateful! 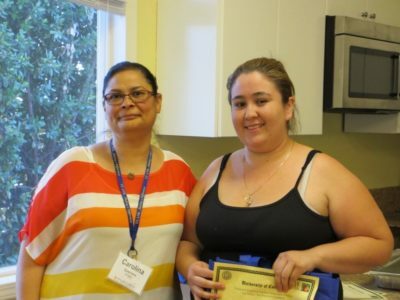 This spring, we collaborate with the University of California Cooperative Extension, (UCCE) and Expanded Food & Nutrition Program, (EFNEP) to offer a Health & Nutrition series to very low-income teenage moms living in East Palo Alto. We served 20 teen moms between the ages of 15 to 22 years old. The moms returned week after week to learn about the importance of choosing whole foods and avoiding high sugar substances such as candy and soda to refrain from exacerbating physical health issues (such as obesity, diabetes) and mental health issues (such as anxiety, depression). 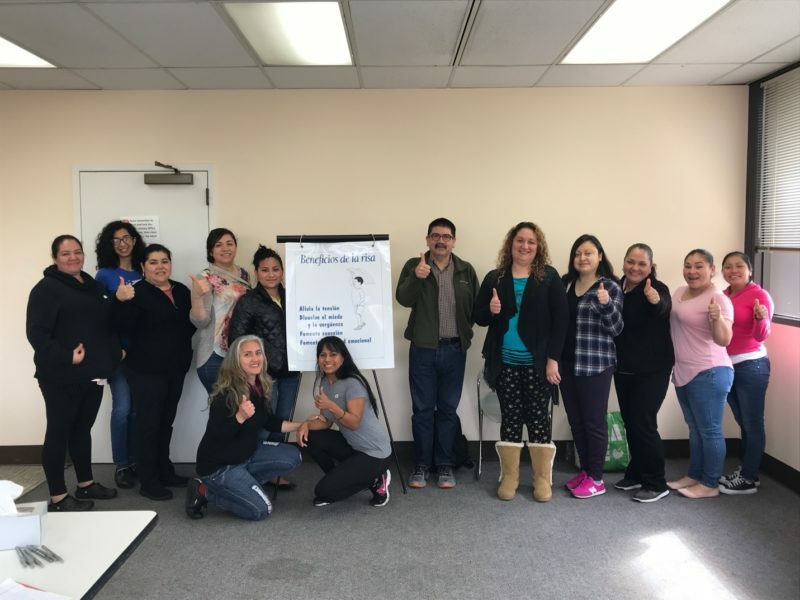 Carolina, our Health & Nutrition facilitator (from UCCE and EFNEP), was able to inspire these moms to make healthier choices for themselves – and for their babies and toddlers. She taught them how to use food stamps to choose healthy foods and she offered cooking demonstrations each week. 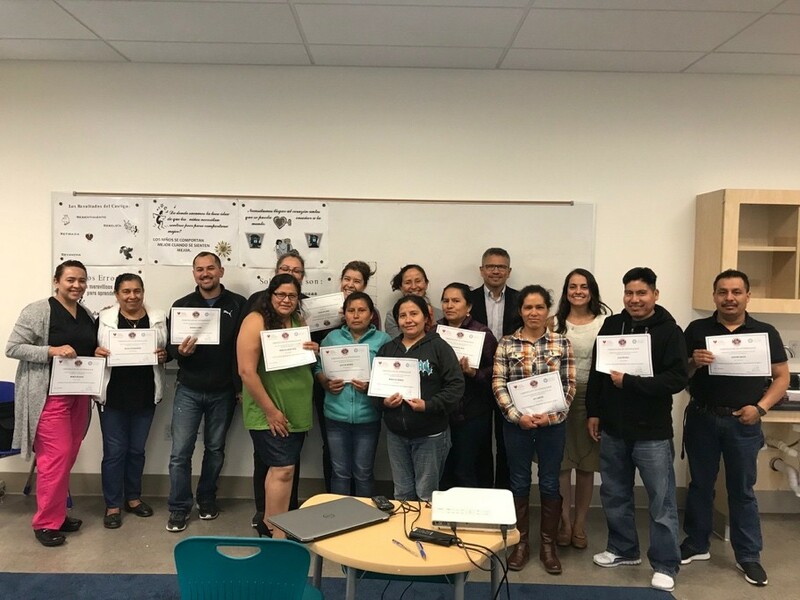 We also offered our spring Positive Discipline – Parent Ed series to the very low-income Spanish-speaking moms in Half Moon Bay. We are pleased to report that we had a very consistent group of 15 parents – including some dads. 14 parents filled out forms the last class. We were inspired by the strong class retention! 71% of participants indicated they have a high school education or less. 100% of the participants indicated a decrease in hitting their children when behaving inappropriately. 93% of the participants indicated that they have a better understanding of what motivates inappropriate behavior, they are better able to take control of themselves and calm down when they feel stress or before resolving a conflict, they take time to listen more often, they spank their child(ren) less often, and are more often able to enjoy and relate to their child(ren) in a positive way. 86% of the participants apologize to their child(ren) more often, have established appropriate limits for their child(ren) as well as appropriate house chores more often, and have decreased the amount of yelling at their child(ren). We’re inspired by these results. The 35 low-income, Spanish speaking moms continue to enjoy the Zumba & Wellness Program. 100% of the 18 participants who filled out the form loved the class and would recommend it to a friend. Of the 95% who reporting feeling better after taking the Zumba class, 100% cited they felt more energy and less stress. 94% of the 95% cited improved mood, more relaxed, uplifted and more connected to their bodies and other moms. 89% of the 95% cited less physical tension and feeling inspired! We are so grateful to our donors for partnering with us to support women, children and families as we help to create a culture of wellness together! We have wonderful news and successes we wanted to share with you from Mind Body Moms. In January, we hired a Project Coordinator, Stephanie Izzarelli. With her local knowledge, strong community engagement and coordination expertise, Stephanie has been a huge asset to Mind Body Moms. We feel so grateful to have her on our team! The low-income, Spanish speaking moms LOVED the new Zumba & Wellness Program this fall. This class came to fruition because of an intimate dialogue we had with a few of the moms after our mindfulness class last year. They informed us that one of the movement classes we were considering – especially Zumba – would be an excellent cultural fit. Many of the moms wanted support with physical health. They informed us that they don’t have funds to take a class like Zumba. 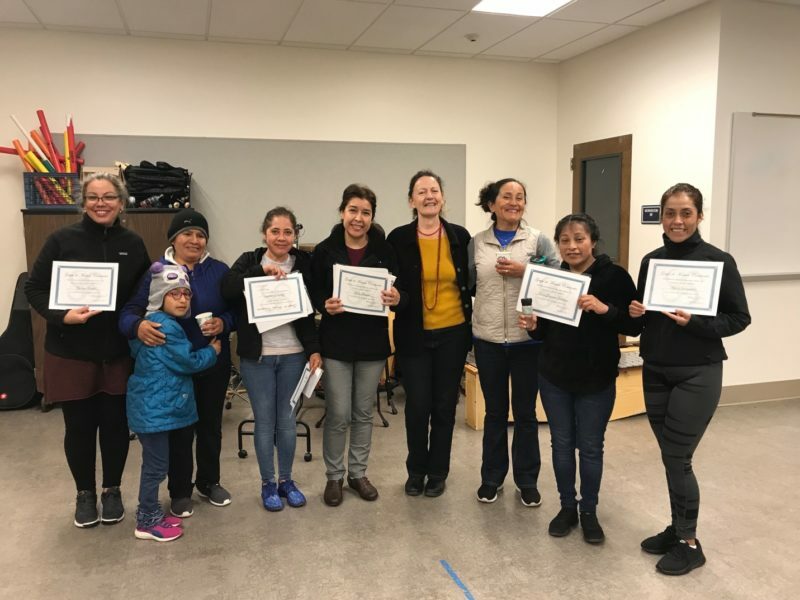 Over 45 moms participated in the Zumba & Wellness Program in fall 2017, a program which focused on boosting physical health, preventing chronic disease, and encouraging playful community connection. 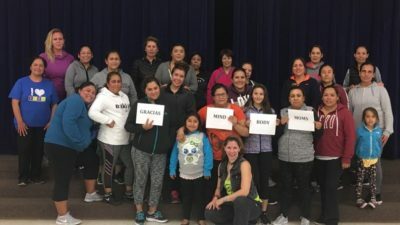 In fact, the moms loved it so much, and were so disappointed to hear that the program was going to end after the 10 weeks were complete, that several of them advocated for the Zumba classes to continue. So we sat down, pooled funds together, and realized that with the help of our donors and sponsors, we would be able to ADD the Zumba class as an ongoing class throughout the school year! The moms were delighted, and so are we! THANK YOU TO OUR DONORS FOR MAKING THIS POSSIBLE!!! 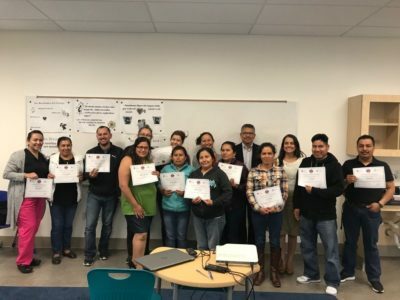 We just wrapped up our winter 2018 Parent Education Program at the East Palo Alto Library on Saturday, April 28! It was a powerful experience with an amazing group of about 20 moms – and even some dads! The participants were so open, authentic and engaged. The very first class, most of them were moved to tears. Their stress is high, and their love of their children runs deep. These women have been coming back each week – ready and eager to learn more about Positive Discipline. Their eyes sometimes well up with tears when we introduce discipline techniques that focus on warm connection instead of aggressive words / physical punishment / withdrawal of affection. They are eagerly seeking new ways to parent and are so grateful for the guidance. We thank our donors for partnering with us to make this possible! We also recently completed our winter Mindfulness & Stress Reduction Program in Half Moon Bay. It was a more intimate group of about 8 moms – and some of them even brought their kids so they could learn to practice mindfulness, too. We feel so blessed to have this opportunity to positively impact the lives of so many women and families, and we truly could not do this work without our supportive partners. We thank our donors for partnering with us to support women, children and families as we help to create a culture of wellness together.